Assaulting the judiciary is as crude and uncivilised as assaulting a referee who impartially and fearlessly applies the rules of the game. Just and fair: When the judiciary decides against the authority it is simply doing its duty under the Constitution which expresses the will of the people just as when it decides for authority. 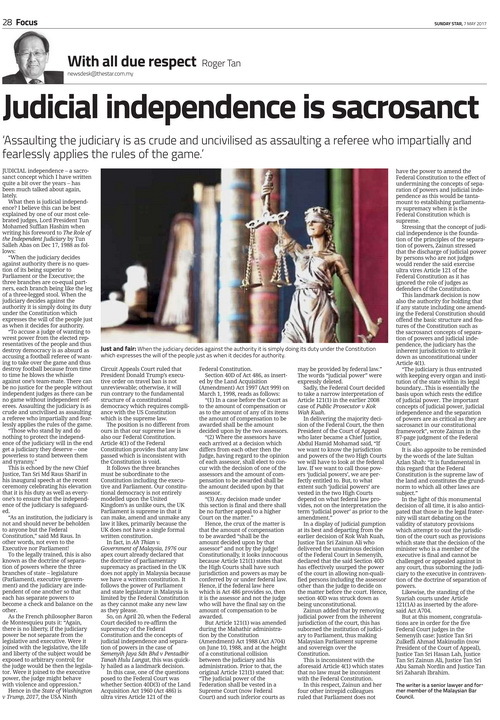 Judicial independence – a sacrosanct concept which I have written quite a bit over the years – has been much talked about again, lately. “When the judiciary decides against authority there is no question of its being superior to Parliament or the Executive; the three branches are co-equal partners, each branch being like the leg of a three-legged stool. When the judiciary decides against the authority it is simply doing its duty under the Constitution which expresses the will of the people just as when it decides for authority. “To accuse a judge of wanting to wrest power from the elected representatives of the people and thus destroy democracy is as absurd as accusing a football referee of wanting to take over the game and thus destroy football because from time to time he blows the whistle against one’s team-mate. There can be no justice for the people without independent judges as there can be no game without independent referees. Assaulting the judiciary is as crude and uncivilised as assaulting a referee who impartially and fearlessly applies the rules of the game. This is echoed by the new Chief Justice, Tan Sri Md Raus Sharif in his inaugural speech at the recent ceremony celebrating his elevation that it is his duty as well as everyone’s to ensure that the independence of the judiciary is safeguarded. “As an institution, the judiciary is not and should never be beholden to anyone but the Federal Constitution,” said Md Raus. In other words, not even to the Executive nor Parliament! To the legally trained, this is also known as the doctrine of separation of powers where the three branches of state – legislature (Parliament), executive (government) and the judiciary are independent of one another so that each has separate powers to become a check and balance on the other. Hence in the State of Washington v Trump, 2017, the USA Ninth Circuit Appeals Court ruled that President Donald Trump’s executive order on travel ban is not unreviewable; otherwise, it will run contrary to the fundamental structure of a constitutional democracy which requires compliance with the US Constitution which is the supreme law. The position is no different from ours in that our supreme law is also our Federal Constitution. Article 4(1) of the Federal Constitution provides that any law passed which is inconsistent with the Constitution is void. It follows the three branches must be subordinate to the Constitution including the executive and Parliament. Our constitutional democracy is not entirely modelled upon the United Kingdom’s as unlike ours, the UK Parliament is supreme in that it can make, amend and unmake any law it likes, primarily because the UK does not have a single formal written constitution. In fact, in Ah Thian v. Government of Malaysia, 1976 our apex court already declared that the doctrine of parliamentary supremacy as practised in the UK does not apply in Malaysia because we have a written constitution. It follows the power of Parliament and state legislature in Malaysia is limited by the Federal Constitution as they cannot make any new law as they please. So, on April 20, when the Federal Court decided to re-affirm the supremacy of the Federal Constitution and the concepts of judicial independence and separation of powers in the case of Semenyih Jaya Sdn Bhd v Pentadbir Tanah Hulu Langat, this was quickly hailed as a landmark decision. In this case, one of the questions posed to the Federal Court was whether Section 40D(3) of the Land Acquisition Act 1960 (Act 486) is ultra vires Article 121 of the Federal Constitution. “(1) In a case before the Court as to the amount of compensation or as to the amount of any of its items the amount of compensation to be awarded shall be the amount decided upon by the two assessors. “(2) Where the assessors have each arrived at a decision which differs from each other then the Judge, having regard to the opinion of each assessor, shall elect to concur with the decision of one of the assessors and the amount of compensation to be awarded shall be the amount decided upon by that assessor. Hence, the crux of the matter is that the amount of compensation to be awarded “shall be the amount decided upon by that assessor” and not by the judge! Constitutionally, it looks innocuous because Article 121(1) states that the High Courts shall have such jurisdiction and powers as may be conferred by or under federal law. Hence, if the federal law here which is Act 486 provides so, then it is the assessor and not the judge who will have the final say on the amount of compensation to be awarded. But Article 121(1) was amended during the Mahathir administration by the Constitution (Amendment) Act 1988 (Act A704) on June 10, 1988, and at the height of a constitutional collision between the judiciary and his administration. Prior to that, the original Article 121(1) stated that: “The judicial power of the Federation shall be vested in a Supreme Court (now Federal Court) and such inferior courts as may be provided by federal law.” The words “judicial power” were expressly deleted. Sadly, the Federal Court decided to take a narrow interpretation of Article 121(1) in the earlier 2008 case of Public Prosecutor v Kok Wah Kuan. In a display of judicial gumption at its best and departing from the earlier decision of Kok Wah Kuan, Justice Tan Sri Zainun Ali who delivered the unanimous decision of the Federal Court in Semenyih, declared that the said Section 40D has effectively usurped the power of the court in allowing non-qualified persons including the assessor other than the judge to decide on the matter before the court. Hence, section 40D was struck down as being unconstitutional. Zainun added that by removing judicial power from the inherent jurisdiction of the court, this has suborned the institution of judiciary to Parliament, thus making Malaysian Parliament supreme and sovereign over the Constitution. This is inconsistent with the aforesaid Article 4(1) which states that no law must be inconsistent with the Federal Constitution. In this respect, Zainun and her four other intrepid colleagues ruled that Parliament does not have the power to amend the Federal Constitution to the effect of undermining the concepts of separation of powers and judicial independence as this would be tantamount to establishing parliamentary supremacy when it is the Federal Constitution which is supreme. Stressing that the concept of judicial independence is the foundation of the principles of the separation of powers, Zainun stressed that the discharge of judicial power by persons who are not judges would render the said exercise ultra vires Article 121 of the Federal Constitution as it has ignored the role of judges as defenders of the Constitution. This landmark decision is now also the authority for holding that if any statute including one amending the Federal Constitution should offend the basic structure and features of the Constitution such as the sacrosanct concepts of separation of powers and judicial independence, the judiciary has the inherent jurisdiction to strike it down as unconstitutional under Article 4(1). “The judiciary is thus entrusted with keeping every organ and institution of the state within its legal boundary...This is essentially the basis upon which rests the edifice of judicial power. The important concepts of judicial power, judicial independence and the separation of powers are as critical as they are sacrosanct in our constitutional framework”, wrote Zainun in the 87-page judgment of the Federal Court. In the light of this monumental decision of all time, it is also anticipated that those in the legal fraternity will start debating on the validity of statutory provisions which attempt to oust the jurisdiction of the court such as provisions which state that the decision of the minister who is a member of the executive is final and cannot be challenged or appealed against in any court, thus suborning the judiciary to the executive in contravention of the doctrine of separation of powers. Likewise, the standing of the Syariah courts under Article 121(1A) as inserted by the aforesaid Act A704. But at this moment, congratulations are in order for the five Federal Court judges in the Semenyih case: Justice Tan Sri Zulkefli Ahmad Makinudin (now President of the Court of Appeal), Justice Tan Sri Hasan Lah, Justice Tan Sri Zainun Ali, Justice Tan Sri Abu Samah Nordin and Justice Tan Sri Zaharah Ibrahim.